Many of us have at least a section of garden that is shady most of the time. Shade gardens can be bor-ring unless you spice them up with plants that have interesting colors, shapes, and textures. These hardy beauties are made for the shade. That is to say, these plants all thrive in shady spaces while adding color and interest. Pop a few of these into your shady space and it just might become your favorite part of the garden. When planting your shade garden, be sure to include a variety of plants with different shapes, sizes, colors, and textures. 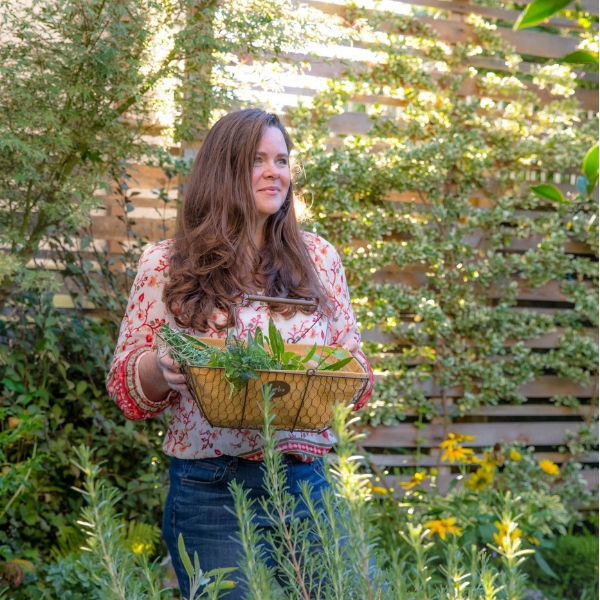 Dark corners of the garden often go unnoticed, but if you intentionally fill up the space with plants that draw the eye and have visual interest, the shadiest part of your garden can become an eye-catching focal point! Some of my very favorite gardens are shade gardens. When the summer sun gets so hot that it feels oppressive, it is a wonderful feeling to retreat to a cool, softly lit part of the garden full of lush, beautiful plants. Traditional Japanese gardens are just gorgeous, and they often incorporate shade into the design. 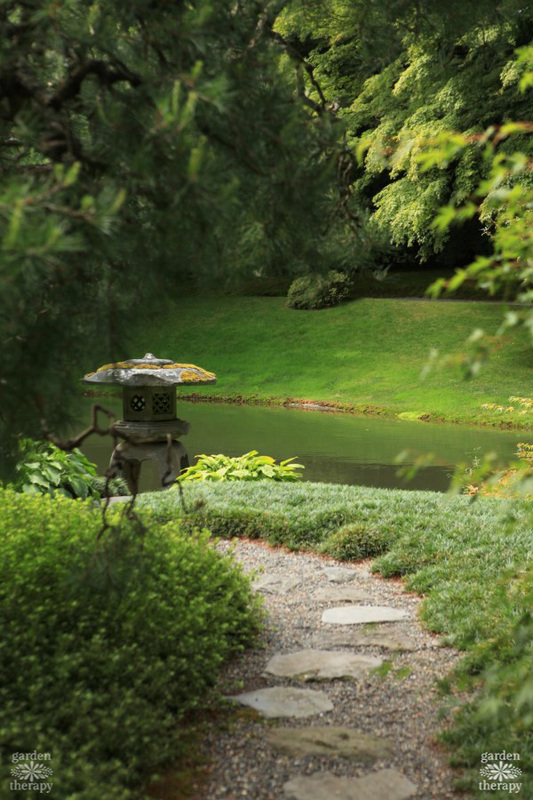 For some serious shade garden inspiration, head over here to take a virtual tour of the Nitobe Memorial Garden at the University of British Columbia. 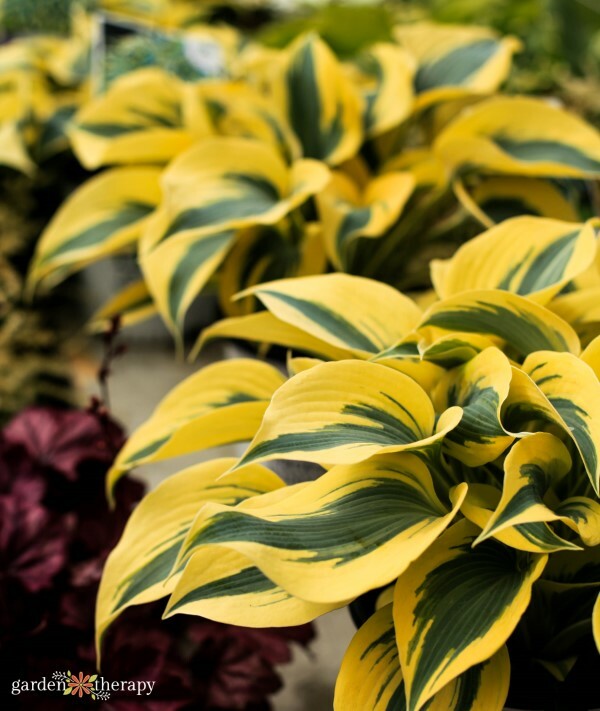 Here are my favorite plants to add to shady areas. If your garden is in full sun, take a look at this post on the best perennials that love the sun! Hellebores have beautiful, delicate, bell-shaped flowers in the late winter and early spring, but many varieties also have very pleasing decorative foliage. Enjoy their beauty in the garden or cut the flowers and float them in a dish of water for a gorgeous table centerpiece. 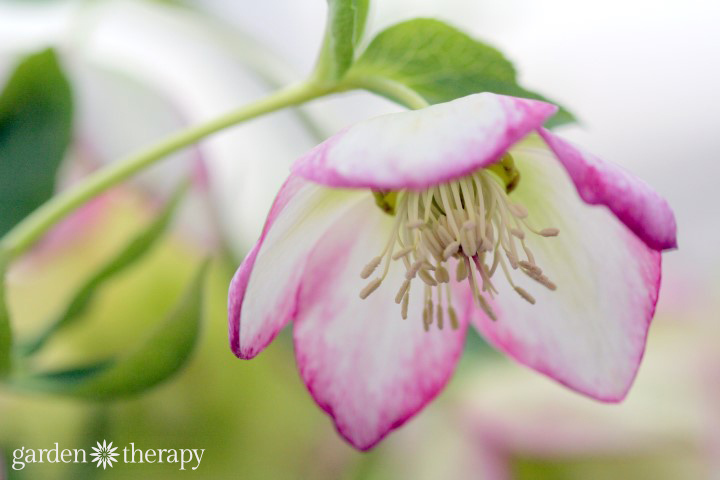 See more about hellebore growing and care here. This geranium grows in large clumps of white or light pink flowers that bloom prolifically from spring until autumn. Cut back when the blooms begin to fade and watch even more appear. It also deters deer, so it’s a great choice if you have local deer who love to munch on your precious garden plants. Makes a great groundcover. 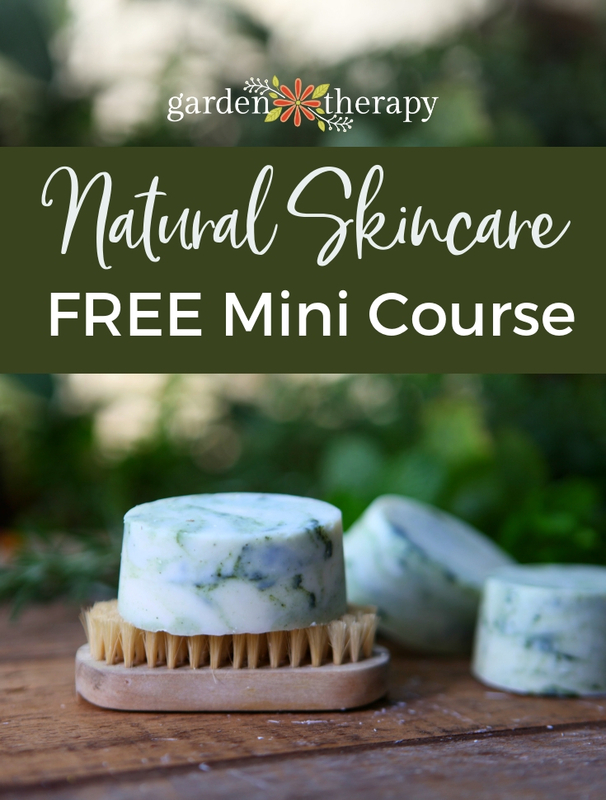 Hostas are known for their large, attractive leaves that come in a wide variety of colors, shapes, and textures (I love the leaves so much that I captured their image in these DIY stepping stones). They produce small flowers in the summer as well but the foliage is the main event. Hostas are also edible! Learn how to cook and eat them in this article. An old garden standby for a reason! The little chains of pink, heart-shaped flowers on this perennial are stunning in spring and early summer. The plant goes dormant after that and is not particularly interesting, but if you want spring interest in your shade garden, don’t skip this plant. 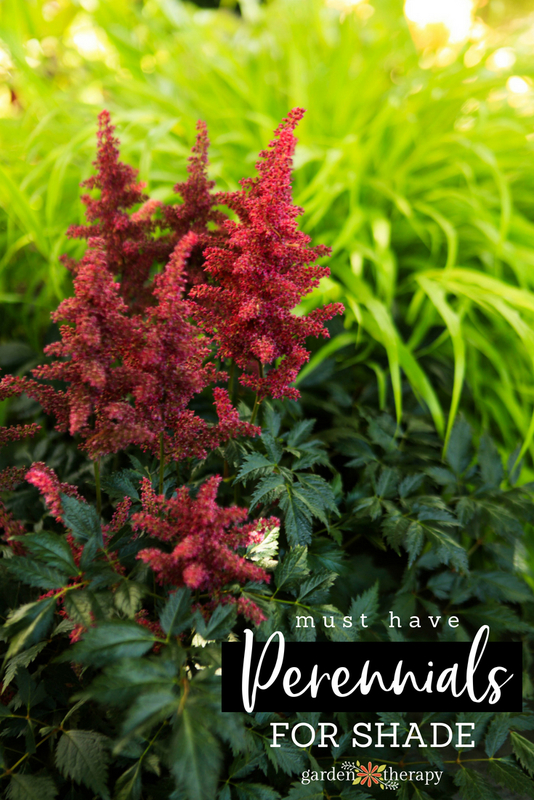 Astilbe have dark, dramatic foliage with jagged edges that create interest. 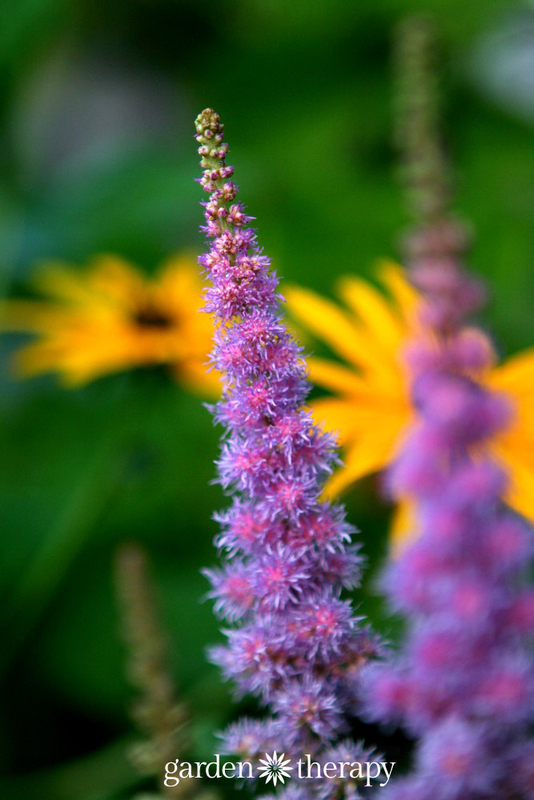 In summertime a tower of pink-to-purple, feathery flower spikes will bloom and steal the show. A pretty way to attract beneficial pollinators to your shade garden. Bees love the bright blue-to-purple flowers of this glossy, low-growing ground cover (see what other plants attract pollinators). Its foliage is also impressive, with dark leaves variegated with white or pink. A great filler plant! 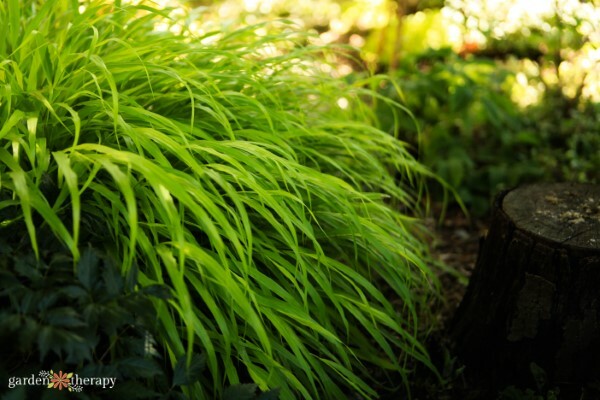 This decorative grass has a gorgeous sculptural shape, and the bright greens and yellows of the variegated blades of grass bring some much needed vibrancy to a dark, shady part of the garden. That covers shade gardens, but what about sunny gardens? Check out this post for the best sun-loving perennials.